Home-style restaurant offers Tilapia prepared in three styles and served with wantan noodles. IN this weeks edition of the Food Trail, we take a look at something out of the extraordinary. Before I get into the details, a very Happy New Year to all of you and may 2014 and the Year of the Horse bring joy and posperity to all. OK, first, I would like to thank Cikgu SC Chin from SMK Seri Garing in Rawang, Selangor for introducing me and my wife Michelle to a makan place in Kampung Lee Kim Sai (GPS N 03 18.607, E 101 34.622). Good eats: The cyclists having a feast at Ah Cheng Fei Chau Yu noodle house in Kg Lee Kim Sai in Rawang, Selangor. We joined Cikgu Chin and his colleague Cikgu Lee on a joyride from Rawang to Batu Arang and covered a distance of 56km.. It was an eye-opener as I was led to places around the township which I never knew existed. The bonus part at the end of the ride was a treat at Ah Cheng Fei Chau Yu wantan mee in Kampung Lee Kim Sai. When I first heard about the noodle dish, I thought it was wantan made from Fei Chau Yee (tilapia mossambica) flesh. This raised plenty of questions among the cyclist. A piece of deep-fried tilapia fillet on the wantan noodles. But when the makan palce was finally revealed, I learned that it is steamed fish with wantan noodles. 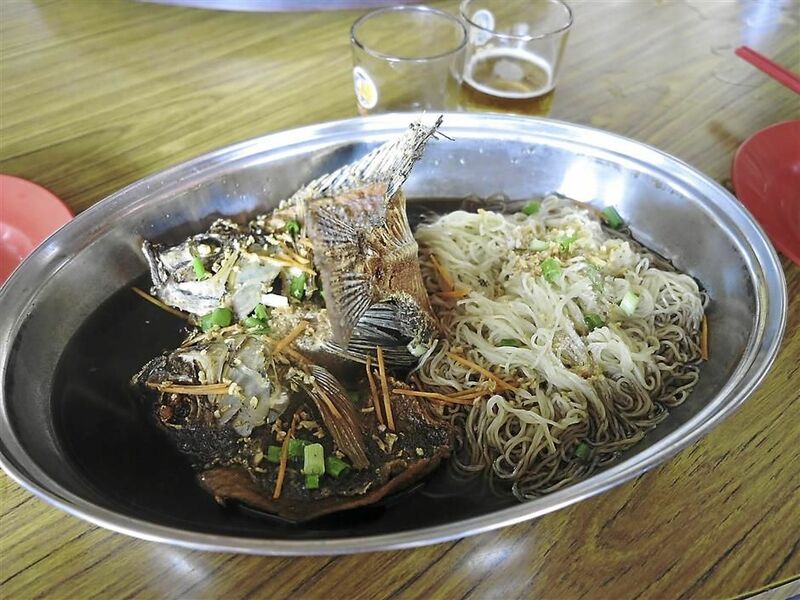 There are several choices on the menu where one can choose to have a piece of steamed fish with noodles. The gravy mixes nicely with the wantan mee and I must say that the steamed tilapia tasted pretty good. It doesnt have that earthy taste (caused by blue-green algea in the bloodstream of freshwater fishes). Highly-recommended is the cheong-ching (soya bean paste gravy) fei chau yee or the yow-chum (deep-fried) noodle dish. A serving of double wantan mee and the deep-fried tilapia is priced at RM14 a plate. 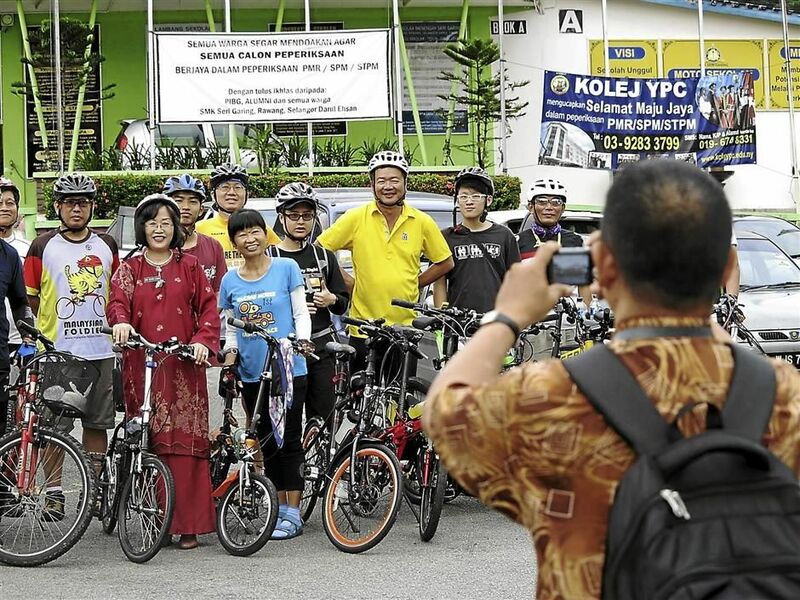 One for the album: The cyclists taking a snapshot with headmistress of SMK Seri Garing in Rawang. This is not cheap, but interesting if you want to try something different. Apart from the noodles, there are other dishes on the menu that you can order to go with white rice. Ah Cheng Fei Chau Yu noodle house opens daily from 8am to 8pm and is located at Jalan LKS 5 in Kampung Lee Kim Sai, Rawang, Selangor.